Preheat the oven to 400°. In a medium bowl, combine the ricotta and mozzarella and the egg. Reserve ¾ cup of the alfredo and spread the remaining sauce in the bottom of a 9-by-13-inch baking dish. Arrange an egg-roll wrapper on a work surface. Spread 3 tablespoons of the ricotta mixture over the wrapper, cover with a slice of ham, then roll up to form a log, jelly-roll style. Repeat with the remaining wrappers and place the cannelloni, seam side down, in a single layer in the baking dish. 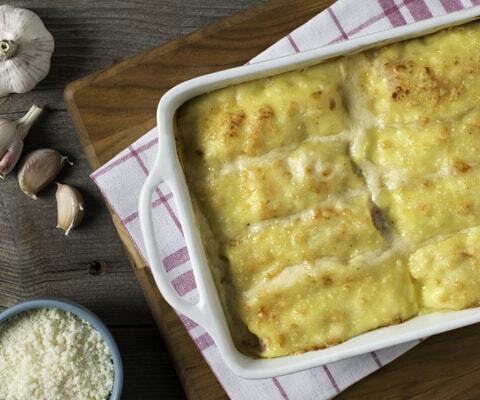 Spoon the reserved cream sauce over the cannelloni, top with the Parmigiano-Reggiano and bake for 20 minutes, or until golden brown and bubbly.